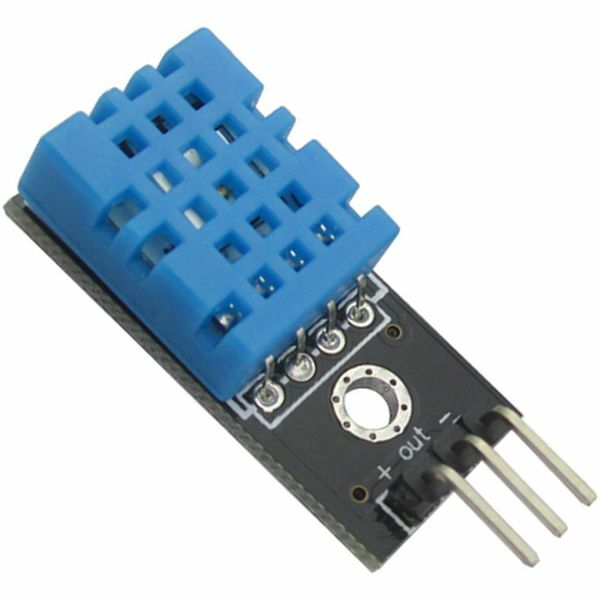 The DHT11 is a basic low cost temperature and humidity sensor you can use with an Arduino. The DHT11 is a digital temperature and humidity sensor. It uses a capacitive humidity sensor and a thermistor to measure the surrounding air, and gives out a digital signal on the data pin (no analog input pins needed). The breakout boardIt comes with 3 jumper wires to make it easier to use. Its fairly simple to use, but requires careful timing to grab data. The only real downside of this sensor is you can only get new data from it once every 2 seconds. Compared to the DHT22, this sensor is less precise, less accurate and works in a smaller range of temperature/humidity, but its smaller and less expensive. Comes with a 4.7K or 10K resistor, which you will want to use as a pullup from the data pin to VCC. If you want multiple sensors, each one must have its own data pin!